Catch the movie JFK: A President Betrayed for free in Detroit. 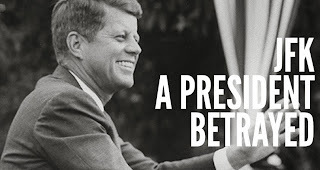 Synopsis: Narrated by Academy Award winner Morgan Freeman, JFK: A President Betrayed uncovers new evidence that reveals how JFK boldly reversed US government policy to embark on secret back-channel peace efforts with Nikita Khrushchev, Fidel Castro and other sworn American enemies. The film brings to light how JFK was subverted by his own advisors and considers how the world might be different had he lived. The free screening of JFK: A President Betrayed will take place at The Maple Theater in Bloomfield Hills, MI at 7:30pm on Tuesday, November 5th. Contest Rules: Only enter if you live in Michigan. Winners will be chosen at random and seating is on a 1st come 1st serve basis. Please arrive early, as it may be overbooked.. Winners will be notified on Monday November 4th. Enjoy the film if you win.